In 2012, Cranleigh Lions funded the manufacture of a beacon fire basket, to be erected outside the Band Room as part of the Cranleigh Village celebrations for the Queen’s Diamond Jubilee. Over 150 people attended the lighting of the beacon and subsequent celebrations. Following the event, the basket was converted to hold a permanent flower display. Then in 2016, the basket was converted back to a beacon, in time for the celebration of the Queens 90th Birthday. 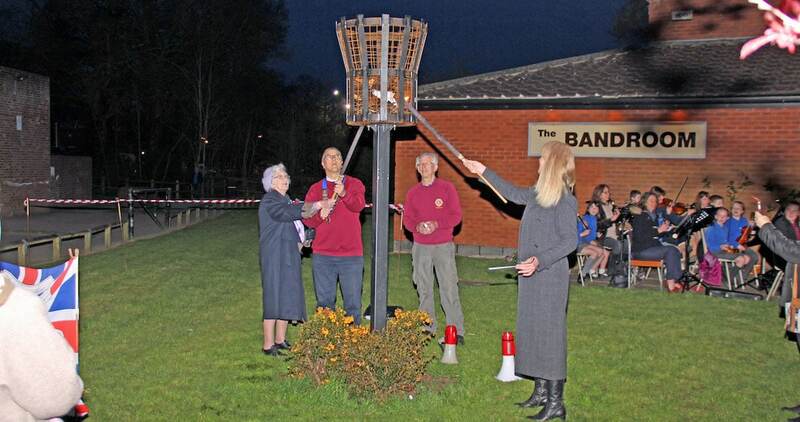 Another large crowd gathered outside the Band Room on 21st April, for the lighting of the beacon by Council Chair, Mary Foryszewski and Cranleigh Lions President Colin Ward. The lighting ceremony was assisted by Mary Gibbs, also celebrating her 90th birthday. Music for the event was provided by the Park Mead School band.